In this tutorial we will create additional models and seed them into the database. After that we will write a simple view that will display a list of items the the grocery store has in stock. Before we start adding more data models to our application, lets install bootstrap. This will install the bootstrap library for the project. if the application.scss file ends in .css, just change it so it has the .scss ending. Now we have Bootstrap 4 added to our application! We are going to add 2 new models, Ordered_Items and Carts. The ordered items model will be a table of items that have been ordered. The Cart will contain items that were ordered by the customer. So there will be some level of overlap that we will have to account for. First lets create the new models. inside the folder /db/migrate, there will be a file ends with create_ordered_items.rb, open that file and edit it so it becomes this. The references fields refers to the tables that the the table is connected to. In this case it is the Item and Cart model. I’ll show you how this connects when we seed example data for this. The last migration we need to create is in order to modify our previous Item table. To do this we run. With the add_column function, this migration adds a integer(number) column called stock to the items table. In order to handle the connected tables we need to write the corresponding associations. With the belongs_to and has_many association functions. We tell the framework that a Item has many Ordered Items connected to it. The Cart also has many ordered_items connected to it. And the Ordered Item belongs to both a Item and Cart. That way when a customer wants to take his or her cart to checkout, it already has all the corresponding ordered items. 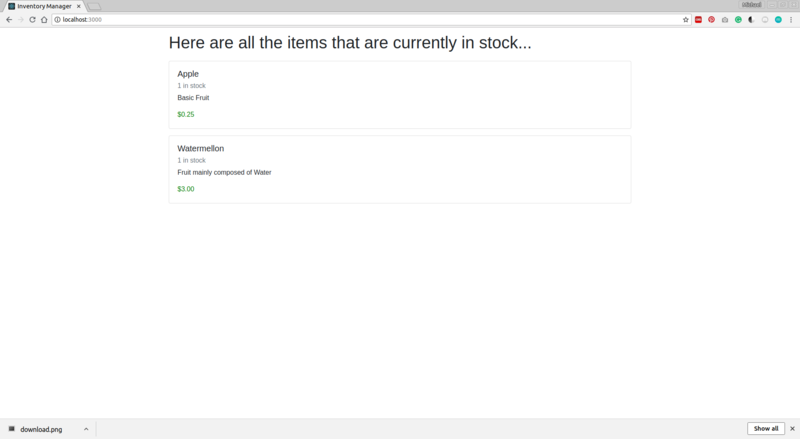 Those ordered items point to the items that are currently in stock. If we want to display the items we have in stock, we need some items! Go into /db/seeds.rb, and edit it so it is like this. to add the new data to the database. Now we have some initial items that we can display. We created a variable called @items that we will be able to reference to within our view template. Item.all retrieves all the rows from the Item model. Now when you visit the / of the rails app. It should display something like this. Great Job! Now people can see what items can be purchased! In the next tutorial, we will start adding functionality that will allow the user to add items to his/her cart.